v If you would make a good bodysnatcher? v What the Georgians did with squashed fish eyes? v Who wore false eyebrows made from mouse skin? Well, I picked up this book solely because I wanted to know something about an interesting race from the Caucasus Ranges but then, little did I expect that this book was going to be about Britain during the era of Hanover monarchs (before William IV and Victoria). However, with that said, I wasn’t disappointed with this book. The uniqueness about horrible histories always is that, the author runs the reader through the selected era in a way in which that the reader is never bored, does not have to remember the dates and still gets a picture of how the society was, during the time. 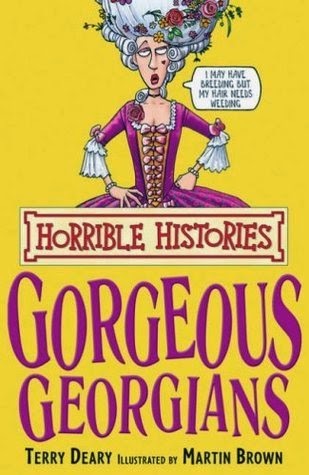 The Georgian addiction towards make-up, the high demand for corpses for the purpose of research, the Luddite wars, and their love for gory sports was all portrayed well, through the usual witty caricatures which are used across all the books of this series. Although, this era didn’t have many interesting battles to cover, following the fall of Napoleon, the author still managed to keep the book interesting, in my opinion. Like any other Horrible Histories book, this too, I believe, has maintained the standard and would be good for light reading while travelling or even when you’re looking for a break after having done some real heavy reading.